This is a personal service. 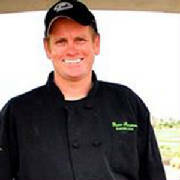 Chef Brian will come to your home and prepare fine, restaurant-quality cuisine in your kitchen. He will cater events, as well as deliver several meals, for your refrigerator, and provide Personal Chef Services which can include several days worth of meals... With this service, he will prepare several meals for several people, then place the prepared foods in labeled, storage containers in your refrigerator and freezer, to be used and eaten at your time of convenience. Personalized Catered event. The Chef will plan, prepare, and plate a delicious dinner party from 15 - 150 guests. Fee plus food costs. 15-30 meals in one day: The Chef will prepare the necessary amount of food agreed upon. In one day he will create the right amount of food for the right amount of people..... Customized weekly meal planning, menu design, all food purchasing and food production. Your refrigerator will be full of your favorite delicious foods. Fee plus food costs. Initial fee plus $25 per person, have a "Cooking Party". One-of-a-Kind Cocktail Parties: Abundant amounts of hand-crafted appetizers, tapas and finger-foods. Customized to fit your theme party and unique style. 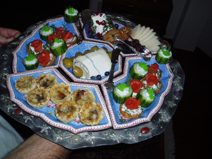 Personalized Catered Events: Daily, weekly, and special parties. Have a chef create the foods you enjoy. Chef Brian will design a menu revolving around your tastes and likes; he will thrill your guests with delicious foods and have them talking about your event for weeks to come.